*The NAV given is for the main share series for the relevant master fund. Investor’s holdings may be in a different share class or series or currency and have a different NAV. See the factsheets and/or your statement for full details. ** The index was adjusted since 1st June 2017. Prior to that it reflects 100% of the MSCI Frontier Markets Asia Net Total Return USD Index, and after 1st June 2017 it is 37% of that index and 63% of the Karachi Stock Exchange 100 index in USD. Emerging and frontier markets were in risk off mode this month as multiple worries over issues such as the macro stability of Argentina and Turkey, a rising US Dollar, and the US calling off the nuclear deal with Iran led to a correction of −9.2% and −3.5% in the MSCI Frontier Markets Index and MSCI Emerging Markets Index respectively. However, developed markets such as the Dow Jones Index, the FTSE 100 Index, and the MSCI World Index were up by +1.0%, +2.2%, and +1.0% respectively. 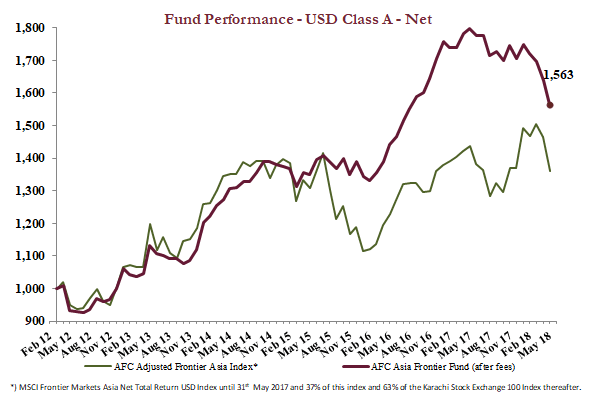 The AFC Asia Frontier Fund lost −4.5% in May, and is now up +56.3% since inception, which corresponds to an annualized return of +7.5% p.a. since inception, reflecting the strategy’s ability to generate consistent long-term returns. 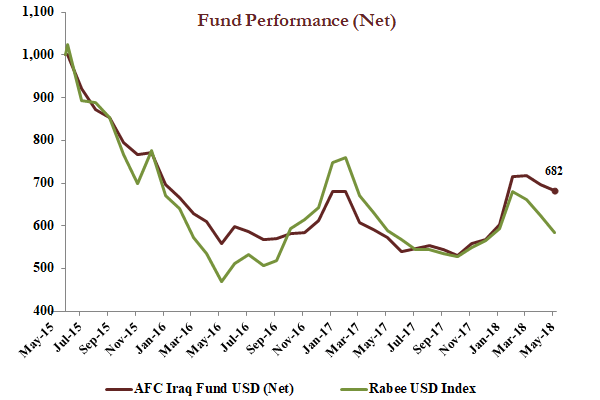 The AFC Iraq Fund lost −2.2% in May, outperforming its benchmark, the Rabee USD index, which lost −6.5%. Year to date the fund has rallied by +20.1%, outperforming the benchmark index by 17.1% so far this year, signalling the long-awaited recovery for the Iraqi equity market after a decline of −68% from the peak in early 2014 until the bottom in May 2016. 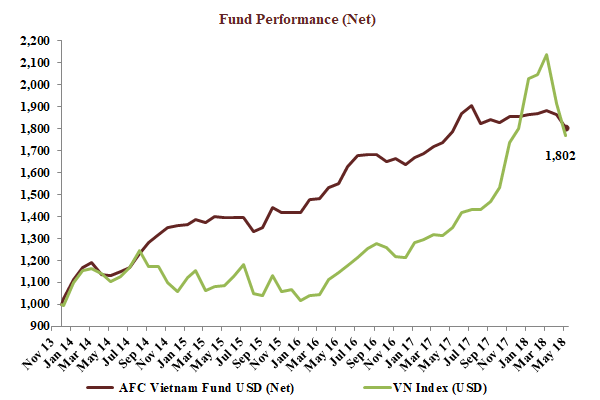 The AFC Vietnam Fund lost −3.2% in May, strongly outperforming the VN-Index in USD terms which lost −7.5%. The fund is now up +80.2% since inception, representing an impressive annualized return of +14.2% p.a. The AFC Asia Frontier Fund (AAFF) USD A-shares declined −4.5% in May 2018 to a NAV of USD 1,563.33. The fund outperformed the MSCI Frontier Markets Asia Net Total Return USD Index (−9.4%), the MSCI Frontier Markets Net Total Return USD Index (−9.2%), and the AFC Frontier Asia Adjusted Index (−7.2%), but underperformed the MSCI World Net Total Return USD Index, which was up +1.0%. The performance of the AFC Asia Frontier Fund A-shares since inception on 31st March 2012 now stands at +56.3% versus the AFC Frontier Asia Adjusted Index, which is up +36.0% during the same time period. The fund’s annualized performance since inception is +7.5% p.a. The broad diversification of the fund’s portfolio has resulted in lower risk with an annualised volatility of 9.12%, a Sharpe ratio of 0.78, and a correlation of the fund versus the MSCI World Net Total Return USD Index of 0.33, all based on monthly observations since inception. Global risk off sentiment impacted almost all global frontier and emerging markets this month as a combination of factors led to a heavy correction. Macro uncertainties in Argentina (a large weight in the global frontier index) and Turkey, a stronger US Dollar and its impact on frontier and emerging currencies, continued uncertainties over the economic impact of the US-China trade war, the US backing out of the Iran nuclear deal and the resulting impact on oil prices and the lack of clarity on possible US-North Korea negotiations were all factors which led to a heavy sell off in frontier and emerging markets, with Asian frontier markets not being spared. Despite the heavy correction in the MSCI Frontier Markets Asia Index over the past two months, the fund’s relative performance was better given the diversified approach and also due to lower exposure to Vietnamese large caps which have a heavy weight in the MSCI Frontier Markets Asia Index. From the fund’s larger markets, Vietnam bore the brunt of the global sell off given the fast run up in the market, especially in 1Q18. 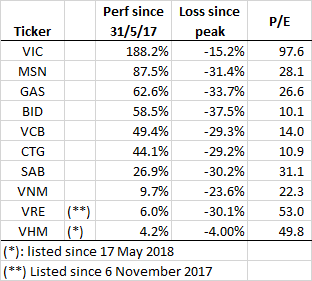 The Ho Chi Minh VN Index has lost around 19% from its high on 9th April 2018, led by large caps as valuations for these companies had a significant run-up over the past year, as has been discussed in previous manager comments, while valuations for small and mid-cap companies remain attractive after the recent market correction. Post correction, valuations of some of the large cap companies are looking more reasonable compared to the start of the year and thus the fund invested in a consumer conglomerate which is beginning to show very robust results for its consumer business. We used this market weakness to increase our position in the country’s airport operator, which is a good proxy for tourism and the economic growth of Vietnam. 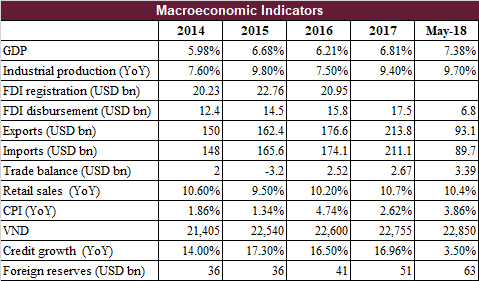 The fundamentals of the Vietnamese economy remain stable relative to other frontier and emerging markets with industrial production, export growth, and tourist arrivals continuing to be strong. The Pakistani market remained weak on the back of macro concerns and political noise in the run-up to national elections which have been scheduled for 25th July 2018. The ruling PML (N) is going into the elections in a weak positon given the political issues surrounding the former Prime Minister, Nawaz Sharif. However, the PML (N) still remains the strongest party in Punjab which accounts for the most seats in the National Assembly. The consensus is for a coalition government to be formed, led by either the PML (N) or Imran Khan led PTI. We believe that if the next government is a PTI led coalition, then this could be a near term negative for the market as the PTI is still untested when it comes to managing various aspects of the country, i.e. economic and foreign policy. We have therefore been reducing our exposure to Pakistan over the past few months and will re-assess the country post elections. On the macro front, the State Bank of Pakistan raised benchmark interest rates by 50 basis points, in addition to the 25 basis point increase in January 2018. The reversal of interest rates was expected due to the anticipated increase in inflation on the back of higher oil prices and Rupee depreciation. The Bangladeshi market remained weak, as it also faces an election later this year, with banking stocks leading the market lower due to continued meddling by the central bank in trying to manage the banking sector’s loan growth and interest margins. The latest move by the central bank, nudging banks to reduce their spreads, seems more like a move to reduce interest rates to appease voters in the run up to elections. We have used the weakness in bank stocks to initiate a positon in the country’s largest bank by market cap as we believe it is well placed to build a retail and consumer banking business, which as a market segment is still nascent in Bangladesh. Further, this bank is expected to continue to build out its mobile financial services platform which recently received a financial investment from Alipay of China. In Sri Lanka, the consumer spending recovery could be impacted by the increase in fuel prices which were raised last month and as per a new government policy which will see fuel prices be adjusted every two months. Though worries over the near-term impact on consumer incomes remain, this is a positive reform from the government. The fund exited its investment in a consumer conglomerate at a good return, while we continued to increase our positon in a telecom operator which is now the fund’s biggest position in Sri Lanka. This company has had a good run of results for the past few quarters, led by data growth on the back of increasing smartphone penetration while valuations remain at a discount to regional players and further consolidation in the sector could be a possibility, which would help larger players consolidate their market position. The fund initiated a position in a Singapore-listed Myanmar play which has interests in real estate, food & beverage, automobiles, and financial services. This company is reducing its exposure to the real estate business as its consumer facing businesses are growing from a low base and have a large market to tap including the mobile financial services business which can grow significantly from its current position. We also recently visited Kazakhstan, Kyrgyzstan, and Uzbekistan and as a result of the trip, initiated our first position in Kazakhstan, buying shares in the country’s largest bank by assets. Kazakhstan is seeing an economic recovery after the oil price collapse of 2014 hurt the largely resources-focused economy. Higher oil prices over the past year have helped create a more stable macro environment for economic growth and the country is expected to play a pivotal role in the land transport route from China to Eurasia as part of the One Belt One Road Initiative (OBOR). More on Kazakhstan, Kyrgyzstan, and Uzbekistan in our upcoming travel reports. The best performing indexes in the AAFF universe in May were Mongolia (-0.1%) and Laos (-0.4%). The poorest performing markets were Vietnam (-7.5%) and Bangladesh (-6.9%). The top-performing portfolio stocks this month were: a holding company from Myanmar (+20.0%), a Mongolian construction product trading company (+14.9), a Mongolian real estate company (+14.9%), a Mongolian trading company (+14.8), and a Vietnamese pump producer (+12.6%). In May, we added to existing positions in Cambodia, Laos, Mongolia, Myanmar, Sri Lanka, and Vietnam. We added as a new position in the portfolio a holding company from Myanmar, a Vietnamese consumer goods conglomerate, and a bank from both Bangladesh and Kazakhstan. We exited a Sri Lankan holding company, a Bangladeshi paint company, and in Pakistan we sold a bank, a cement company, and a pharmaceutical company. As of 31st May 2018, the portfolio was invested in 106 companies, 1 fund, and held 9.4% in cash. The two biggest stock positions were a pharmaceutical company in Bangladesh (7.2%) and a pump manufacturer from Vietnam (4.1%). The countries with the largest asset allocation include Vietnam (24.7%), Bangladesh (17.8%), and Mongolia (15.9%). The sectors with the largest allocations of assets are consumer goods (28.1%) and industrials (17.0%). The estimated weighted average trailing portfolio P/E ratio (only companies with profit) was 13.14x, the estimated weighted average P/B ratio was 2.54x, and the estimated portfolio dividend yield was 3.69%. The AFC Iraq Fund Class D shares returned −2.2% in May with a NAV of USD 681.73 which is an out-performance versus its benchmark, the RSISUSD index, which lost −6.5%. Year to date the AFC Iraq Fund Class D shares are up +20.1% vs +3.0% for the RSISUSD index. A key aspect of the Iraq investment opportunity is arbitraging the delta between the real and perceived risk. The perceptions of the widely covered parliamentary elections fit within this arbitrage opportunity in that they miss the mark by a wide margin. The May elections did not result in an overall winner with an outright majority (165 seats among the parliament’s 329 seats) enabling the formation of a government. Instead, they produced winners and losers who will eventually form a coalition government. At the lead is Sairoon, a coalition of Shia cleric Muqtada Al Sadr, Communists and Liberals, with 54 seats; followed by Fateh, a coalition of the political arms of the Popular Mobilisation Units (PMU’s), with 48 seats; finally, Nasr, the Prime Minister’s (PM) coalition, with 42 seats. The rest are made up of: five different coalitions each with 18-25 seats; four coalitions each with 4-6 seats; and finally, a gaggle each with 1-3 seats. The next step would be the formation of an alliance of coalition that would, on the first day of the new parliament by end of June, have the largest number of seats to enable it to have a PM with a chance of forming a government. The whole process should take a few weeks but in the past, it took a few months. The winning coalitions, irrespective of their lead player, are all cross-sectarian unlike the prior ethno-sectarian monolithic blocs that dominated over the past 14 years – a division that was the root cause of Iraq’s political and social instability since 2003. Moreover, for the first time since 2003 there was a strong mass opposition to these ethno-sectarian monolithic blocs that manifested itself in an active non-participation movement. This led to an election participation turnout of 44.5%, which in turn had huge effects on the seats won and lost by the different coalitions. Drilling further into the leading blocks shows neither they nor their leading players conform to simplistic assumptions. For example, Muqtada Al Sadr is often described as a firebrand cleric who is anti-secular, anti-Western and pro-Iran as a result of his leading role in Iraq’s dark history since 2003. Yet at least outwardly, he went through a transformation to a firebrand cleric who is anti-Iran and anti-its proxies in Iraq, whose alliance with communists and seculars kept the 2015 pro-reform demonstrations alive and relevant. Moreover, he was a leading player in rebuilding Iraq’s relationship with Saudi Arabia and the UAE - both received him in their capitals in 2017 to further this rebuilding. The second leading coalition, Fateh, a grouping of the political arms of the supposedly pro-Iranian PMU’s, although not all are, is led by Iranian-allied Bader Organization. Yet Bader has been a part of every Iraqi government since 2005, responsible for the Ministry of the Interior, and as such a major part of the next phase of Western support for Iraq in rebuilding its security apparatus in the long-term fight against ISIS. 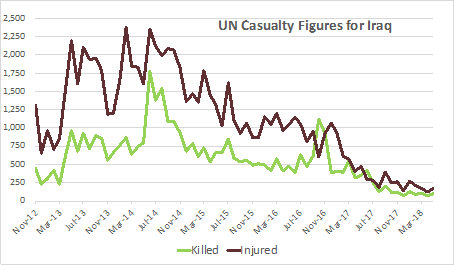 The most visible fruit of which has been the decline of violence since the end of the Mosul campaign and in the first violence free elections (see chart below). Finally, the Naser coalition which is led by the PM, and while much admired for leading the fight against ISIS he suffers from perceptions of failure to address the demands of the demonstrators since 2015. Although an unfair criticism given the overriding priority to deal with the ISIS invasion, it was behind much of the reason behind his coalition’s third place showing. Nonetheless, his chances of returning as a PM capable of leading a workable government are high. Optimists see the potential for a coalition governing with a clear reform agenda and with a proper opposition in parliament providing a check on the government. The pessimists however see a repeat of the prior coalition governments that were made up of all groupings in parliament, and thus no real change to the failures since 2003. However, irrespective of who would be right, a few things are clear that would have implications for Iraq’s economy, the investment opportunity in Iraq and the stock market. The combination of the lead by Sadr’s coalition, the continued pro-reform demonstrations since 2015, and the large active non-participation movement together imply that the upcoming government would need to address the issues at the heart of the public’s anger. This would be the provision of services and reconstruction, which require much needed overdue investments in the country’s infrastructure and the reconstruction of the liberated areas. The new oil price dynamics have a huge positive implication on Iraq’s ability to provide funds for this massive investment spending estimated at USD 88bn over the next five years. Current estimates (IMF Iraq Country Report 17/251, August 2017) for the country’s revenues for 2017-2022 are based on Iraqi oil price assumptions of USD 45.3/bbl in 2017 and increasing to USD 47.1/bbl by 2022. These estimates would result in a cumulative deficit of USD 17.6bn, thereby increasing the debt load, necessitating borrowing to fund the deficit and restrict the ability to fund reconstruction. This implies the need for outside aid and investment to fund reconstruction. However, different assumptions based on the new oil price dynamics would provide a vastly different picture. For instance, using realized prices of Iraqi oil of USD 49.2/bbl for 2017, and assuming Iraqi oil prices of USD 60/bbl for 2018, then declining to USD 51/bbl in 2022, would produce a cumulative surplus of USD 47.4bn instead of the earlier assumed cumulative deficit of USD 17.6bn. In other words, this equals a turnaround of USD 65bn in potential available funds. While, an assumption of an oil price of USD 64/bbl for 2018, then declining to USD 55/bbl by 2022 would produce a cumulative surplus of USD 78.2bn, or a turnaround of USD 95bn in in potential available funds. Granted some of this windfall will result in higher government spending, especially on populist measures which would be detracting from the funds available for infrastructure investment. Though this would nevertheless be a large positive for consumer confidence and economic activity, all of which would ultimately support the earnings profile of consumer service providers and the banking sector. In the immediate term, given the impossibility of forecasting future oil prices out to 2022, if Iraq’s oil price was to hold the YTD average for the remainder of 2018 it would convert the IMF 2018 projected deficit of USD 9.5bn into a surplus of USD 10.9bn. Coupled with a slight positive variance to 2019 projections, this would provide Iraq with enough fiscal flexibility to start directly funding the immediate needs for reconstruction. This changed fiscal position would further allow it to comfortably access debt markets at reasonable rates to build upon this reconstruction. The potential addition of regional investments led by Saudi Arabia, as discussed here in the past, could lead to a self-reinforcing investment cycle. The stock market’s action in the weeks before and after the elections has been business as usual and very much followed the same themes discussed over the last few months. This is an indication of how much negative news the market has discounted over the last three years that saw the index, as measured by the RSISUSD Index, decline -68% from its 2014 peak to the 2016 bottom. The daily market action has been almost identical to that of the prior month with the same low turnover, the same buying in the selected leading stocks, and the same selling in the banks based on the same fears. The fasting month of Ramadan, which began in mid-May, has contributed to declining volumes and by extension to stock price declines. The response of the currency to the elections for the most part matches that of the market with the market price of the Iraqi Dinar (IQD) weakening versus the USD in the days around the elections but returning to the same levels at the start of the month. 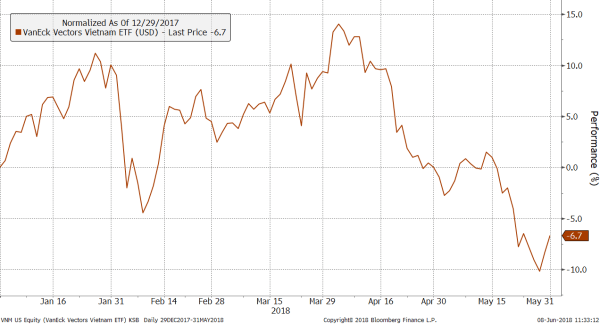 The upshot is that the premium of the market price of the IQD over the official exchange rate increased from 1.2% at the end of April, reaching 2% just before the elections and is now back to 1.2%. The issue that continues to dominate the market is the timing of the return of liquidity as a result of the expansionary effects of higher oil prices and the end of conflict. 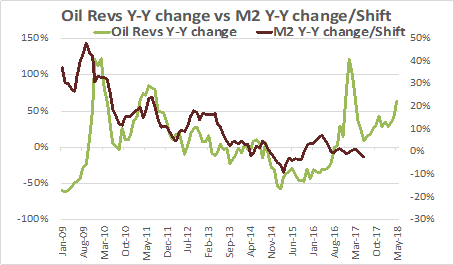 As discussed here in the past, the observed time lag between Y-Y changes in oil revenues and Y-Y changes in M2 has been about 7-9 months which suggests that M2 growth should see improvement over the next few months as the chart below implies: it shifts the Y-Y percentage change in M2 back by 9 months versus the Y-Y percentage change in oil revenues. However, it is complicated by the additional time taken up by pre and post elections, and the additional time needed for the formation of the new government. All of this will delay the recovery but would likely result in a large back-end loaded return of liquidity. Adding to the complications are increasing demands for a manual recount of the results as many are claiming that electronic readers of ballots were subject to fraud. The outgoing parliament has passed a law to this effect; however, this is subject to the supreme court’s ongoing review of the constitutionality of the retroactive law. A manual recount, should it happen, would probably take 3-6 months, which implies a new government formation would be delayed until year end 2018 or early 2019. While, this might lead to a delay to the start of capital expenditures, yet it would mean that the current government has a free hand to implement the reconstruction free from interferences until year end. The market’s early reaction on the day following the news was for a +2% rise on the day, and while one day does not make a trend yet it indicates the continuation of the business as usual for the market as outlined earlier. 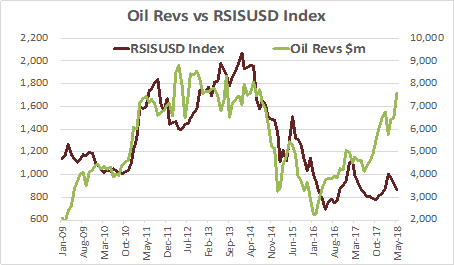 As argued here in the recent past, the backdrop continues to be positive: historically the equity market, as measured by the RSISUSD Index, has tended to follow oil revenues with a time lag of 3-6 months as the chart below shows. Given the time lag involved and the delay over the formation of the new government, this will probably unfold over the next few months and the recovery will likely be in fits and starts with plenty of zig-zags along the way. This continues to underscore the opportunity to acquire attractive assets that have yet to discount a sustainable economic recovery. As of 31st May 2018, the AFC Iraq Fund was invested in 14 names and held 4.2% in cash. The fund invests in both local and foreign listed companies that have the majority of their business activities in Iraq. The markets with the largest asset allocation were Iraq (96.0), Norway (3.0%), and the UK (1.0%). The sectors with the largest allocation of assets were financials (46.5%) and consumer staples (22.8%). The estimated trailing median portfolio P/E ratio was 13.82x, the estimated trailing weighted average P/B ratio was 0.91x, and the estimated portfolio dividend yield was 6.22%. 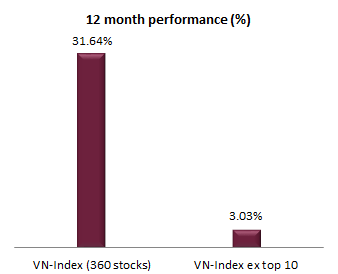 The AFC Vietnam Fund lost −3.2% in May with a NAV of USD 1,802.50, bringing the return since inception to +80.2%. This represents an annualised return of +14.2% p.a. The Ho Chi Minh City VN Index in USD lost −7.7%, while the Hanoi VH Index lost −6.5% (in USD terms). The broad diversification of the fund’s portfolio resulted in a low annualized volatility of 8.85%, a high Sharpe ratio of 1.54, and a low correlation of the fund versus the MSCI World Index USD of 0.26, all based on monthly observations. Large cap stocks led to another strong decline in May, despite a 4% rebound in the last three trading days of the month. The HCMC index lost -7.4% and the Hanoi index -6.3%. Both indexes have now erased all of their previous gains for 2018 and are now slightly down for the year. The weak sentiment also dragged down most small- and midcap stocks, but to a much lesser extent. According to internal calculations our NAV is at USD 1,800, down -3.4% for the month. As May was another weak month for the index, for reasons we have explained many times before, investors are now finally looking for alternatives to companies trading with high levels of volatility – and also some unrealistic valuations. 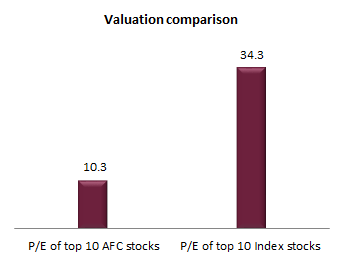 Not only do we find that now the media and analysts are increasingly reporting about the immense valuation gap between the top ten stocks and the other hundreds of stocks trading at half of their valuation, but also new capital is being raised by large institutions for investing into small- and midcap stocks as investors obviously see potential and value in this space. After the huge and unrealistic price rise of the largest stocks, a sharp correction was to be expected. We can also see that despite the decline in the premium paid for those stocks, it continues to be too high in a historic context. Excluding the top 10 stocks, the performance of the stock market would have been similar to our portfolio - more or less flat. Longer term, we are very convinced that like in any other market, only a broad advance will lead to a sustainable bull market, and our stocks will outperform as they did in the past, without the phase of irrational exuberance of a few hyped stocks. As expected, the index recovery was very short lived and weakness was seen all over the board in the second half of the month. Index heavyweights with lofty valuations were hit hardest, similar to April. When speaking of the index, some are already joking about renaming it the “VIN”-Index since the Vincom Group makes up one fourth of the total index after the listing of its subsidiary, Vinhomes. Since many, or most larger funds need to track the index, a listing like Vinhomes means forced buying by many funds, regardless of the fact that all three of Vincom Groups companies are trading at or above 40x trailing earnings. Intensifying the influence of those listings is the fact that buying happens on the market right after listing, pushing up the stock and the index, as stocks are usually not offered before the listing, unlike in an IPO in the western world. To better understand how flawed the index movement in Vietnam has been over the last 12 months, just imagine if the Dow Jones Industrial Average (“Dow Jones Index”) changed its components massively every few weeks and therefore the weightings within the index would also change strongly and would hence have wild money flows as a consequence. Heavily weighted stocks in the HSX index just a few months ago, like Sabeco, Vincom, PetroVietnam Gas or FLC Faros, which gained strongly in the second half of last year, and therefore pushed up the index, lost a good part of this gain over the past few months (Sabeco down -30% since last November, Vincom down -15% since April, PetroVietnam Gas down -34% since April and FLC Faros down -68% since last November), but because other stocks were listed in the meantime, the losses of the former index leaders affected the index to a much lesser extent than an index would have been affected with mostly constant components like the Dow Jones, German DAX, etc. Another example is VP Bank, one of the most desired banks in the market. Foreign investors rushed to buy when bank stocks surged massively on bullish sentiment. In only two months, March and April 2018, 32 million shares were purchased by foreign investors at an average price of VND 67,000 per share. Since then, the stock has lost -33%, falling to VND 45,000 per share. Investors of course do not see this arithmetic behind the move of Vietnam’s indices, but all funds are strongly affected as they have the choice to either invest into those stocks regardless of their valuation and opinion on their outlook, or to ignore them, as we do, and either out- or underperform the index strongly. Most of the index-heavyweights with ping-pong style price movements as of late simply show neither any correlation with the economy in general nor the majority of stocks. With that in mind, it is no wonder that we see more funds and the media looking into “our” stock universe of small- and mid-caps as there are plenty of attractive opportunities around. Investors in general see Vietnam as a small player within the big group of emerging and frontier markets, which is not at all our view. Strong movements in currency and bond markets around the globe will of course also impact the flow of money into and out of Vietnam, mostly via ETF’s or big funds, but we do not think it is necessary to discuss in detail why Vietnam cannot or should not be compared economically to countries like Argentina, Venezuela, or Nigeria. Since Vietnam’s stock market is still dominated by local retail investors, only a major economic crisis would be able to derail the country’s positive path. Unlike in some countries in South America or Africa, we regard the political stability in Vietnam as “high” which provides greater security for both financial and commercial investors in Vietnam. We believe that a good part of the correction should already be behind us and the market is now in a “floor finding period” which might take some time, but many undervalued stocks will most likely already be able to outperform in that kind of environment. 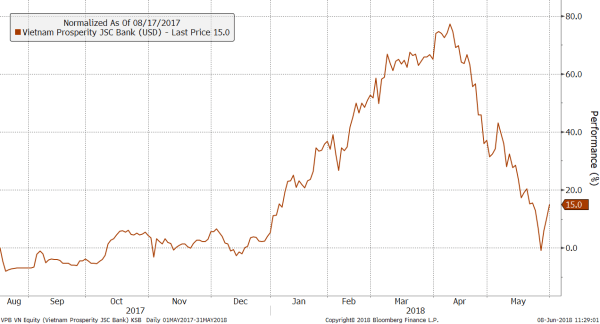 Despite the FED slowly raising USD interest rates, many Asian currencies held steady and weakening was mostly seen in countries with macroeconomic or political instability. With its strong economic fundamentals, the Vietnamese Dong weathered that storm pretty well. At the end of May 2018, the fund’s largest positions were: Agriculture Bank Insurance JSC (3.6%) – an insurance company, Sametel Corporation (2.9%) – a manufacturer of electrical and telecom equipment, Global Electrical Technology Corporation (2.5%) – an electrical equipment company, Cantho Pesticides JSC (2.2%) – a manufacturer of agricultural chemicals, and TanCang Logistics and Stevedoring JSC (2.1%) – a logistics company. The portfolio was invested in 73 names and held 4.3% in cash. The sectors with the largest allocation of assets were consumer goods (32.8%) and industrials (32.1%). The fund’s estimated weighted average trailing P/E ratio was 9.64x, the estimated weighted average P/B ratio was 1.56x and the estimated portfolio dividend yield was 7.16%. 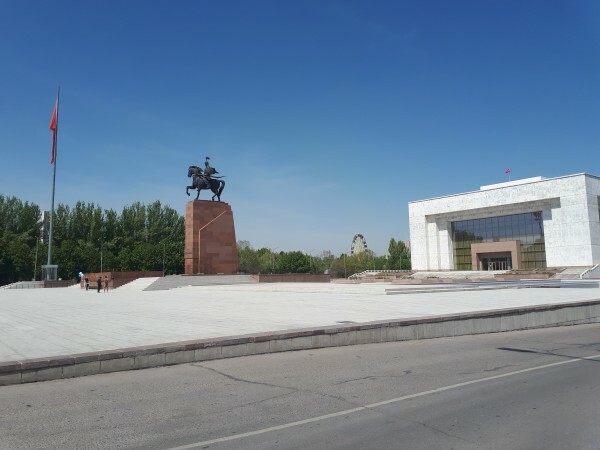 In line with our process of being on the ground in the countries we invest in, Scott Osheroff (Regional Analyst) travelled to Kyrgyzstan in order to meet with companies and an official of the local stock market. All photos are by Asia Frontier Capital. Touching down at Manas International Airport in Bishkek, Kyrgyzstan’s capital, after having made the 45-minute flight from Almaty, Kazakhstan, I was keen to learn about the country and its economic prospects. Disembarking the plane and standing in line for immigration it became immediately apparent that Kyrgyzstan is much more open to outsiders than its northern neighbour, Kazakhstan. The immigration queue was busy but moved very fast as there were two lines—one for parents with children and the other for everyone else. With no immigration or arrival card, as is needed in Kazakhstan, the line of at least 100 moved quickly and after being greeted by the immigration with a “Welcome to Kyrgyzstan” I was off to wait for my bag. Getting into the taxi and making our way towards Bishkek the driver was keen to start a conversation, though he didn’t speak English. I spoke neither Kyrgyz nor Russian. So after running through the languages we didn’t speak we eventually settled on Spanish! The road from Manas Airport to Bishkek may be the nicest in the country, with two lanes each way and newly paved with minimal traffic. As we made the drive towards my hotel in the downtown of Bishkek the snow-capped mountains which buffer the city became increasingly visible on the horizon amid the early evening sun. The next morning, I was met by my contact and new friend who was one of the founders of the Kyrgyz Stock Exchange, Central Depository, and a previous head of the State Service for Financial Market Regulation and Supervision (the Kyrgyz equivalent of the SEC). Over a breakfast of monty (teardrop-shaped meat dumplings) and black tea we discussed the business environment in Kyrgyzstan, as well as the current state of affairs at the stock exchange. 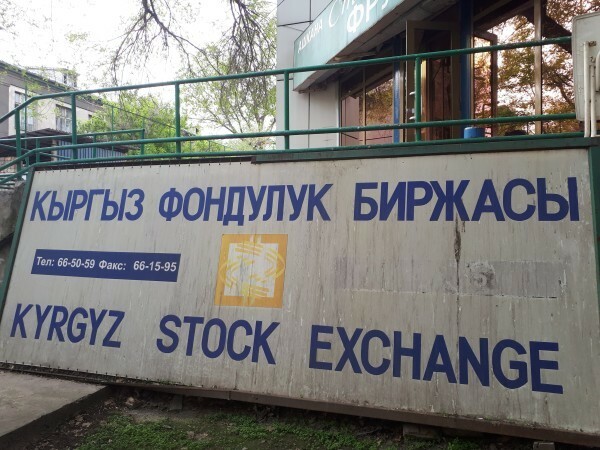 The Kyrgyz Stock Exchange lists 21 companies, all of which have varying degrees of government ownership, though it seems the government is slowly warming up to the fact that if they sell down their stakes they will realize some price discovery in several of the very undervalued listed companies and potentially kickstart a greater interest in the exchange as liquidity increases. Currently most locals are keen to invest into the corporate bond market as they seem to prefer cash flow over capital appreciation. Further, a better functioning stock market could encourage some of the very interesting private companies in the country to IPO, something which would be a first in the country’s history as all of the companies currently listed were part of the government’s privatization program. After breakfast we took a walk through the downtown area where the famous statue of Manas, from the poem “The Epic of Manas” is situated, parliament and the old Ministry of Finance. 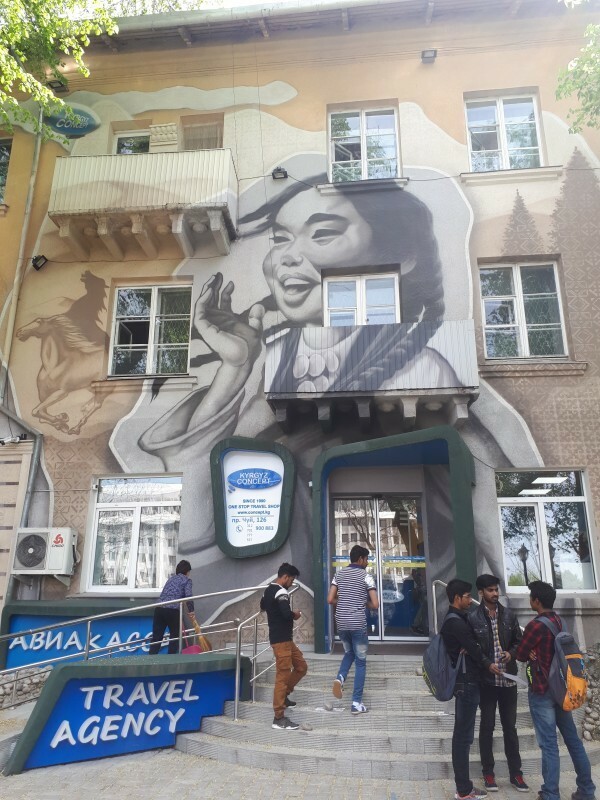 Downtown Bishkek has a relaxed feel to it and many of the Soviet-era apartment blocks have been well maintained and are increasingly home to hip coffee shops and restaurants. Statue of Manas in the city centre. Later that evening I had dinner in the city centre with a public advisor to the President of Kyrgyzstan who had previously built his own logistics business in Kyrgyzstan and Kazakhstan. Currently he is involved in several businesses including holding a seat on the board of Kyrgyztelecom. We discussed the investment climate in the country and particularly the fact that there is a robust start-up community in Kyrgyzstan in the fields of tech, agriculture and services. Some of the tech companies are managing the back-ends for prominent companies in Europe and America. Though what struck me as particularly interesting is due to a dearth of venture capital and private equity in the country, most businesses carry minimal debt and have an early focus on becoming cash flow positive due to the fact that borrowing is challenging and entrepreneurs have to make it with the funds they have in their pockets. This is of course the polar opposite of the Silicon Valley style start-up model. At this point he mentioned that the stock market could be a suitable avenue for financing, especially for the more established SME’s in the country, but that it would be good to first see the government sell down its stakes in the existing listed companies (Kyrgyztelecom among them) as part of a first phase of future development of the exchange. The next morning, Monday, I had my first meeting with the Kyrgyz Stock Exchange. 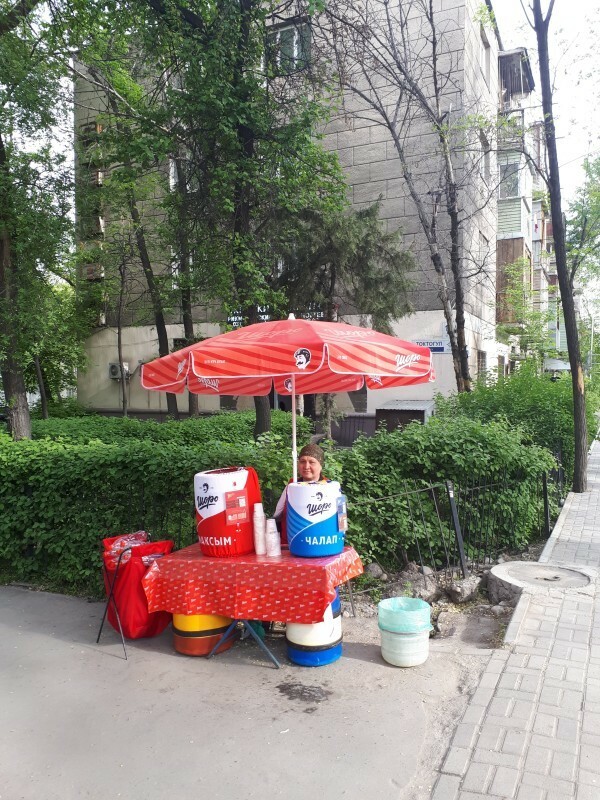 Walking from my hotel to the exchange I passed by one of many stalls selling the local beverage Maxim, a drink made of bulgur wheat and various dairy products, a cool beverage to start what was to become a very hot day. In Central Asia the seasons can change fast and the day prior the high was about 21 Celsius, while on this day the mercury was expected to reach 33 Celsius. Maxim is a product of the largest F&B manufacturer in Kyrgyzstan and would be an ideal candidate for an IPO. Having arrived at the building of the Kyrgyz Stock exchange ten minutes to nine in the morning I thought I was in the wrong place, save for the sign out front, as there was no one in the building, not even security. With my curiosity peaked I started opening every door to see if someone was in the building. Walking upstairs, behind one or the doors I eventually found Almaz Tashbaev, the Vice President of the Kyrgyz Stock Exchange. We have a good conversation about the focus on driving education about the stock market and their attempt to get several companies to IPO. One of these companies is reportedly a construction company, so we will wait to see what happens. My next meeting was with the Chairman of a listed company whose main business is the importation and selling of construction materials through its own home improvement centres, Stroipark. Having exclusivity for dozens of brands, including Schindler elevators, their goal is to build out more Stroipark centers throughout the country, as well as expand into Uzbekistan and Kazakhstan. The Chairman also said he would consider an IPO in the future in order to fund the growth of the business. Of course, Stroipark would be a good proxy for growth in the Kyrgyz economy. 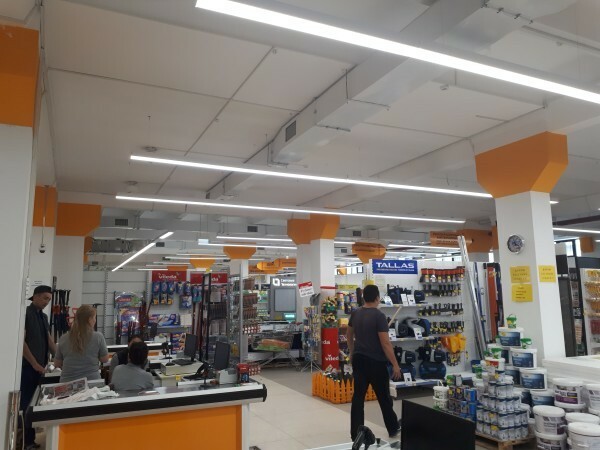 The largest home improvement centre in Kyrgyzstan. My final meeting during my 3-day trip to Kyrgyzstan was with KICB bank, one of the five largest banks in the country with equity holders including KFW, IFC, and EBRD. The bank has a robust net interest margin of 9% and additionally is benefitting from a USD 500 million program from the Russian and Kyrgyz governments to subsidize mortgages. The government is providing capital to KICB at 1% per year and KICB is lending at 5%, a stark contrast to the current market rate of 18% for existing mortgage products. 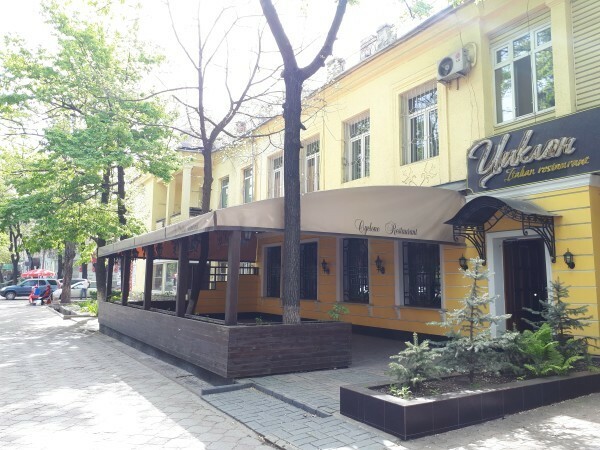 With most home purchases currently paid for in cash, there is immense potential to develop the mortgage market which in turn could help to stimulate the construction market, for at present there is a shortage of housing stock in Bishkek, a city of 1 million. Kyrgyzstan is a hidden gem among its Central Asian neighbors and benefitting from its free market environment, the country offers great future potential, both through the gradual development of the financial markets, but also through its largely untapped tourism market and potential as a significant supplier of hydro-electric power to its neighbours. Kyrgyzstan is a country to watch.